Submitted by: Marsha G., H.S. Visual Arts The First Academy, Orlando FL. Learn about the history of shoes and shoes from various cultures. Create a shoe using slab and coil techniques. 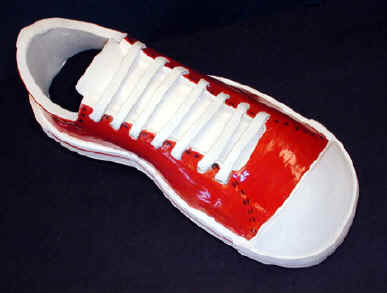 Become familiar with basic additive and subtractive sculpting methods while adding imaginative features to their shoe. Exhibit craftsmanship in using clay. 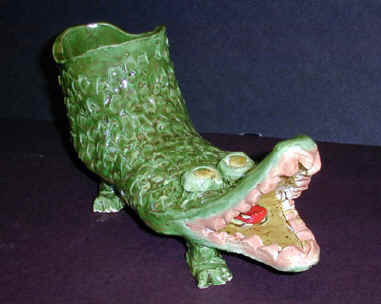 Learn glazing techniques by finishing their shoe with underglazes and/or glazes. Demonstrate each step of the project before the students start that step. 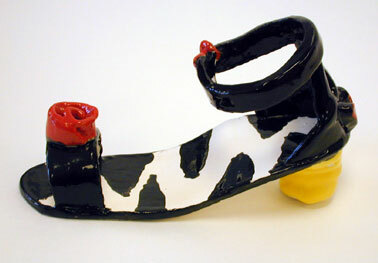 This lesson is based upon PowerPoint examples from research on shoes online. Following a discussion on history and funky adaptations for shoes, and unusual shoes through time and from various cultures, students will brainstorm a list of random ideas for shoes. See what comes up... shoes to cook in, shoes to go around the world in, shoes to wear in prison, shoes to wear on the ceiling, shoes for a first date or when you want to break up with someone, shoes to hold water, shoes with a mind of their own, shoes that sing, shoes that float, shoes for the depressed, shoes for a rhino, shoes to wear to a barbecue, shoes for a dog trainer, etc., etc., etc. Just random as can be, for at least 5 minutes. Last time she made paradise sandals... real looking toes in the front, (looked like them, anyway), flowers and lizards made up the straps, twigs wrapped the bottom, the strip across the toe was water flowing around pebbles, the heel was a hibiscus bloom. Sadly, they broke while she was cleaning the kiln room. Make tag board patterns and cut out. Using a rolling pin and wooden slats, roll out an even slab of clay. Cut the sole of your shoe from this slab. (Hint: no matter what the shoe looks like, the soles will be the same basic shape) You might want to even use your own foot for scale (although clay will shrink so finished shoe will be smaller). Form the heel of the shoe using slab, coil, or pinching methods. Attach heel to upside down sole, then place shoe right side up. Support arch of shoe if needed with wads of newspaper. Use additive and subtractive techniques to add the remaining details. Each shoe will require different methods. Score and slip sections together. If making two shoe s- student will want to work on both at the same time to insure equal size. After firing, glaze with underglazes and Clear Glaze -- or glazes and fire again. Did I brainstorm long enough to come up with a clever idea? Did I develop my sketch with originality? Did I make my clay pattern to scale prior to cutting my clay? Did I use proper joining techniques? Did I spend time on details and refining of my clay shoes? What is the title of my project? 1. Create an original design - make several thumbnail sketches? 2. Create the basic form of the shoe using slabs and coils? 3. Use both additive and subtractive methods to create interesting features on their shoe? 4. Finish shoes using underglazes and/or glazes; were they used correctly? Students learned all about the history of shoes and shoes from other countries. The girls researched designer shoe wear, the history of women's shoes, etc, plus experienced working with clay and glazing. 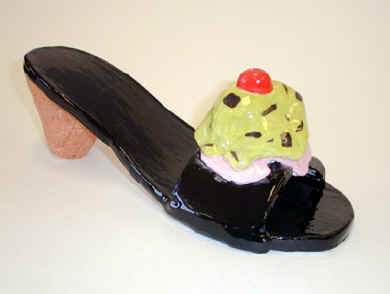 They designed a summer shoe and created it in clay. Underglazes were used.